The 2017 Volkswagen Jetta provides drivers with a great features, incredible performance, and plenty of customization options. To make sure that drivers are able to find the perfect fit for their needs, the Jetta provides multiple trim level options to choose from. Commonwealth Volkswagen feels our customers are family, and we want to make you feel appreciated. Shop us last and join the Commonwealth family, starting with your 2017 Jetta. Each of the available trim options is able to provide drivers with a little something more than the last. This helps to ensure that drivers are able to get the pricing, features, and performance that work for them to make their lifestyle easier and more convenient. Trendline – The introductory trim level of the 2017 Jetta provides drivers with a great starting setup that includes 15-inch steel wheels with full wheel covers and all-season tires, 60/40 split-folding rear seats, six-way manually adjustable front seats, and rearview camera. Trendline + – The next trim level up gives drivers everything the Trendline offers along with providing an alarm system, heated seats, power adjustable and heated exterior mirrors, remote transmitters for central locking, and USB audio input. Wolfsburg Edition – The special edition Wolfsburg model includes equipment from the Trendline + along with 16-inch Estrada alloy wheels with all-season tires, rear seats with center armrest and pass-through, App-Connect, a Discover Media Centre, and a special Wolfsburg Edition badge. Highline – The highest trim level of the Jetta is able to provide everything on the Wolfsburg Edition plus 17-inch Lancaster alloy wheels, ambient interior lighting, Blind Spot Detection with Rear Traffic Alert, leather seating surfaces, and HomeLink. 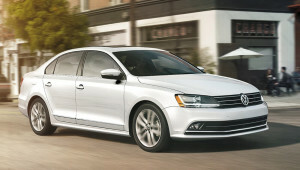 Regardless of the features and customization options that you decide on for your new 2017 Volkswagen Jetta, there are a handful of great features and performance options that each trim level shares. For example, every Jetta has the ability to provide drivers with a selection of powertrains that are high-performing and incredibly fuel efficient with mileage as high as 28 mpg in the city and 40 mpg* on the highway with the 1.4L Turbo engine. The 2017 Volkswagen Jetta, ensures that you’ll be able to find the trim level that fits your budget, your style, and your performance needs. There’s no reason for you to wait to find out which trim fits you best, just stop by Commonwealth Volkswagen today to test drive the vehicles and see their features in person. You can find our dealership located at 1 Commonwealth Drive in Lawrence directly off of I-495. For your convenience we can also be contacted through our website or by phone at 888-257-7247 to schedule a test drive or service appointment. *Based on EPA estimates. See www.fueleconomy.gov for details. Your mileage with vary and depends on several factors, including your driving habits and vehicle condition.